Welcome to Olde Tyme Antiques, offering rustic furniture, antique home furnishings and much more through our Minnesota based antique store. We love antiques and antique furniture and welcome those who share the same passion for collectables as we do to one of our Minnesota antique shops. As we continue to build out our online store, inventory will be updated frequently so we encourage you to check back often for updated products. Vintage Stools, Tables and More at our Minnesota Antique Store! 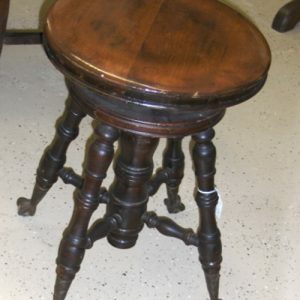 At Olde Tyme Antiques, you won’t find your everyday stools and tables. Instead what you will find are rustic, antique and truly collectable pieces that have been refinished for future use or to be used for “show” in your home or office. Our 4 legged piano stool is in great condition and swivels up or down to accommodate the piano player. Whether you’re considering purchasing a piece of rustic furniture or antique furnishings for personal use or as a gift, start your search with Olde Tyme Antiques! Olde Tyme Antiques recently began offering an online shopping experience to our past and potential customers. If you aren’t from the Minnesota area and can’t make it into one of our antique shops, we welcome you to our e-store! If you have questions about a specific product, ordering or shipping, give us a call at 507-437-3343 for further assistance.